PIANO PEDAL SPECIAL REPORT - UPDATED August 2017 - Piano Pedals in Acoustic & Digital Pianos - Damper or Sustain Pedal, Sostenuto Pedal, Soft Pedal. Are they important and how should they work? 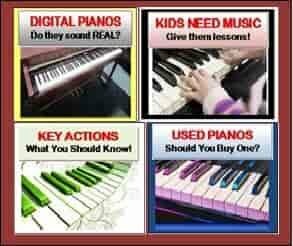 What YOU need to know when shopping for a Digital Piano! 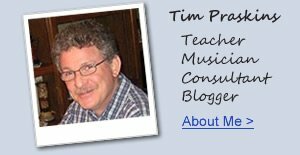 My name is Tim Praskins and I am a professional piano instructor, musician, and also teach and play guitar, pro synthesizer, and organ. 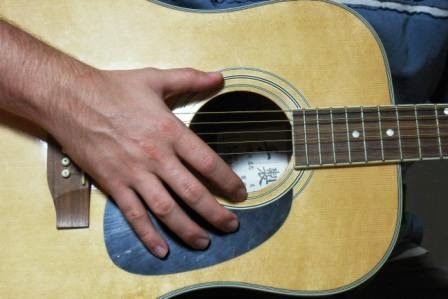 When it comes to making beautiful music on instruments, particularly piano, guitar, harp, and other instruments with strings, the sustain quality & sustain time of these instruments is vitally important. Sustain is the ability of and amount of time a musical instrument can hold a tone over specific period of time without stopping. Digital piano shoppers typically overlook the pedals as being important or even different in various brands and models, and this is because unless you play piano well and have experience with playing acoustic pianos, you don't really know why pedals are important, particularly when shopping for digital pianos. With regard to piano (acoustic or digital), there are typically three pedals that come out of the front center of the instrument at the bottom for a grand upright piano (upper left pic) and on an upright piano (left pic). The pedals on a grand piano actually come out of a separate pedal assembly called a grand piano pedal lyre which helps give the grand piano its distinctive appearance. 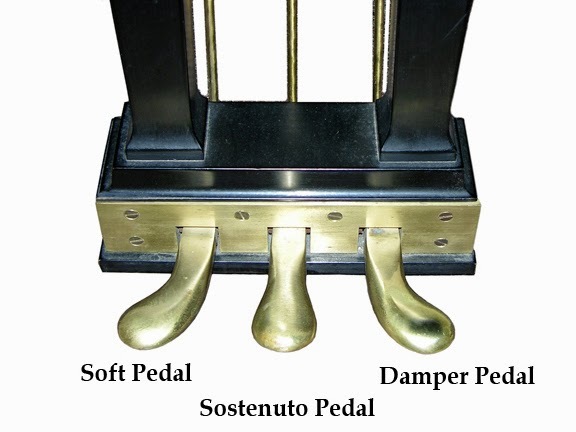 The three pedals are called (from left to right) the soft or una-corda pedal, sostenuto pedal, and damper or sustain pedal. I will talking exclusively about the damper pedal (furthest right pedal) in this report which is also called the sustain pedal. Those two terms (damper & sustain) can generally be used interchangeably by people although those words do have a few differences. For the sake of this discussion I will be referring to this right piano pedal as the damper pedal. I will refer to the piano sustain time in this discussion as decay time. The right piano pedal is referred to as damper pedal because on the inside of the piano you have lots of strings, as I mentioned earlier, and all of those strings will sustain unless there are dampers on or in-between them. 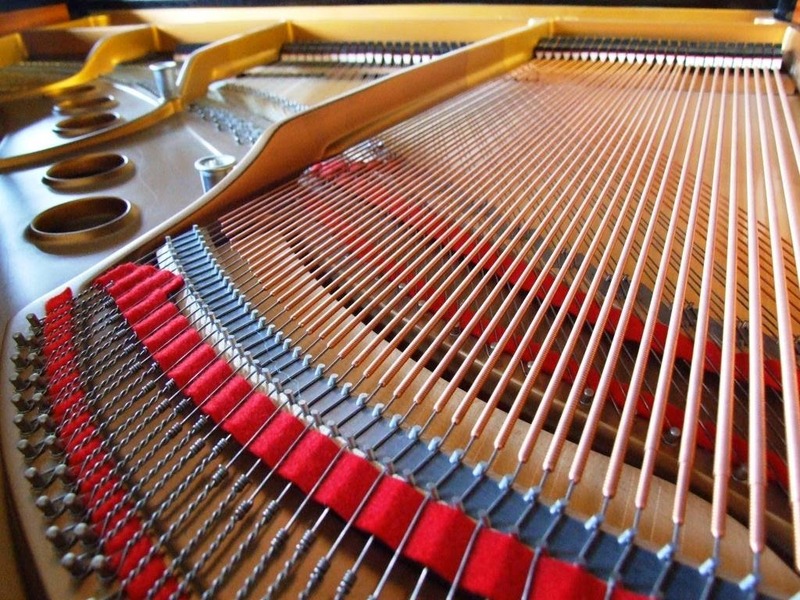 In fact, grand pianos have approximately 230 strings, so imagine tuning all those strings so the piano can sound good....that is a very big and difficult job if you don't know what you're doing. 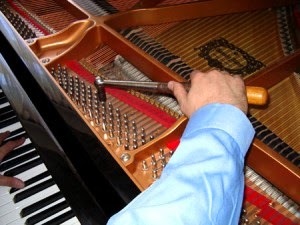 So it's important that your acoustic piano get tuned by a qualified tuner/technician. 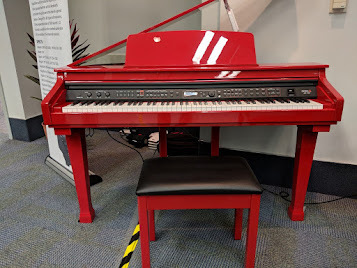 However, in a digital piano, you do not need to tune the strings because there are no strings inside a digital piano and the string sound is digitally reproduced instead. This is a major advantage to a digital piano over an acoustic piano and is why a lot of families like digital pianos. Plus, you can plug in stereo headphones in digital pianos to play in privacy whereas regular acoustic pianos are always loud or louder and can never be played privately. pictures, you'll notice different size dampers on different sized strings. So they are not all the same. 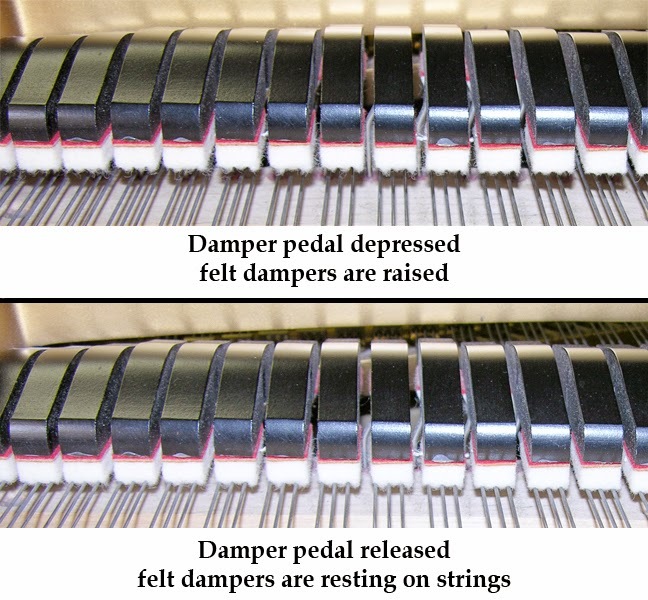 Normally when the piano damper pedal is not pressed and is in its normal up position, the damper felts are directly on the strings, muting all of them except for the last (approx) octave and 1/2 of the keys which is about 19 black & white keys on an average acoustic piano, depending on the make and model of piano. 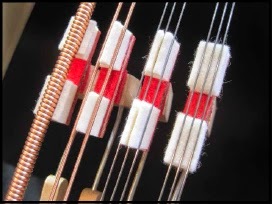 The highest strings need to vibrate all the time without being muted by dampers at any time, so they do not have dampers at all. There are good reasons for that being the case, but all we need to know at this point is those last octave & 1/2 of strings don't have dampers because they need to sustain all the time. If you did not press the damper pedal down and just pressed the key down and then let it back up, the sound would immediately stop or be damped...hence the name damper pedal. The strings are always damped or muted when the pedal is up and not pushed down with your foot. Once you press the pedal down then all of the dampers, which are on a damper rail, come off the strings for the time the pedal is held down. As long as the pedal stays down, the keys that are being played on the piano which strike the strings to make the sound, will continue to be heard until you let the pedal come back up or when the string(s) stops sustaining and vibrating on its own, whichever comes first. As an example, if you pushed the damper pedal down and didn't let it come back up and then played a very low bass key, you would hear that bass string inside the piano continue to make sound until you released the pedal back up. The bass strings are large and thick (left pic) and therefore will normally have a much longer time of natural sustain than higher strings when the pedal is pressed down. As I mentioned earlier but it's worth repeating, natural decay time on a real acoustic piano, which is the time it takes for the sound to fade away after striking a key while holding the pedal down, can be as short as a few seconds on the high strings to about 30 seconds or more on the low bass strings depending on the piano (grand or upright), whether it's new or used, and the quality of the strings themselves. Wow, 30 seconds or more is a long time for the sound to continue to be heard without interruption, and during that 30 second sustain decay time on the low bass strings (with the damper pedal held down), the volume is decreasing slowly & evenly over that time so that it gets more difficult to hear the sound until it's GONE. Are you understanding all this yet? pedal is pressed all the way down, the felt dampers are completely off the strings so the sustain effect is completely on maximum. 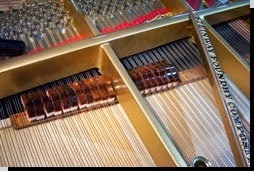 However, in a real acoustic piano, the felt dampers can also be partially on the strings but not completely on or off. This happens when the pedal is pressed approximately half way down. A real acoustic piano has this middle area of sustain which is not quite off and not quite on. It's a transitional point when playing music and using the damper pedal. It occurs naturally on all acoustic pianos and is something which is necessary to have. If you are a beginner, then that natural half-pedal effect will be of little or no importance to you and you will probably not notice it. But as you progress and become more proficient in your playing, you'll want to know your piano can do this half-pedaling and that it becomes a part of playing the piano. On most digital keyboards which have less than 88 keys and the keys are not weighted, including some keyboards that have good piano sounds, there is usually no half-damper pedal effect when pressing the basic pedal down. Most keyboards only come with one damper/sustain pedal (left pic) which is OK, but if that pedal cannot digitally reproduce the authentic characteristics of real acoustic damper pedal playing, then I call that a concern if your goal is to play piano music correctly and you are at or want to be at a higher playing skill level. If the instrument pedal cannot produce the half-damper effect, then you need to consider that before making a purchase. 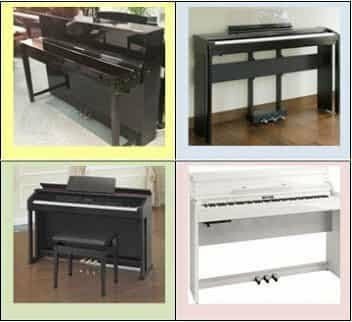 Most piano pedals on digital keyboards and furniture cabinet pianos look very similar so you cannot just tell by the looks of the pedal if it actually will operate like a real acoustic piano pedal. You need to look at the actual piano specifications to know for sure. In the world of portable & furniture cabinet digital pianos, some of those pianos either cannot produce the half damper effect at all, or in the case of some portable 88-key weighted digital pianos, you would need to buy an option single pedal that would be able to do that and that typically adds between $50-$75 extra to the cost, but it's worth it. In the case of specific digital pianos which cannot support half-damper effect at all, every piano model in the Kurzweil brand, including their furniture cabinet pianos up to $5000, cannot do the half-pedal effect and there is no way to change it or add it. 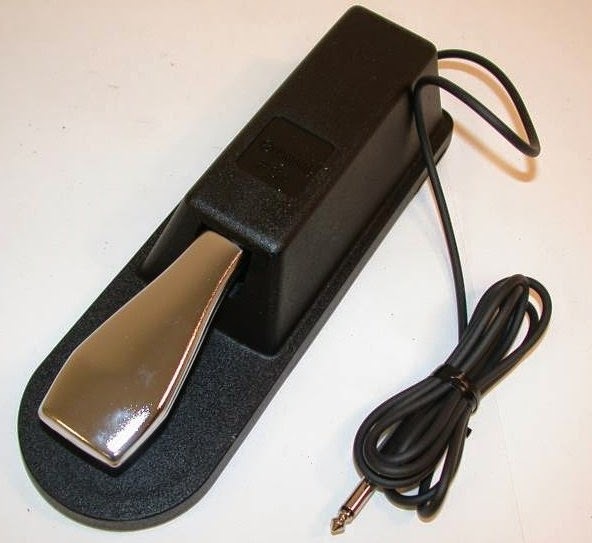 The Kurzweil damper/sustain pedal operates like a keyboard pedal in that way so I do not recommend those pianos for that reason, unless you are at a low playing skill level or you just don't care and like the pianos otherwise. If you don't care, then the damper pedal without the half-damper effect may be fine for you, although there may be other things lacking in the pedal sound. But just be aware that if that function isn't there and you want it later in that piano (including pedal resonance and natural echo), you won't get it. 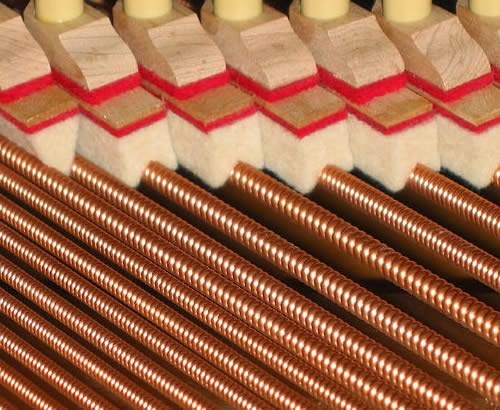 In addition to the half-damper function, when the piano dampers are lifted off the strings in a real acoustic piano by pressing the damper pedal down, a certain amount of natural echo or reverb is heard inside the chamber where the strings are located in the piano. This natural reverb echo along with the natural vibrations of the strings when the dampers are pushed away from the strings, create what is known as damper resonance. This effect only occurs when the damper pedal is pressed down and the keys are played. Damper pedal resonance is a part of the entire piano sound that you would hear when playing music on an acoustic piano. Without this naturally occurring element in acoustic pianos, those pianos with likely sound almost fake and unrealistic, like you had cut something out of the sound. 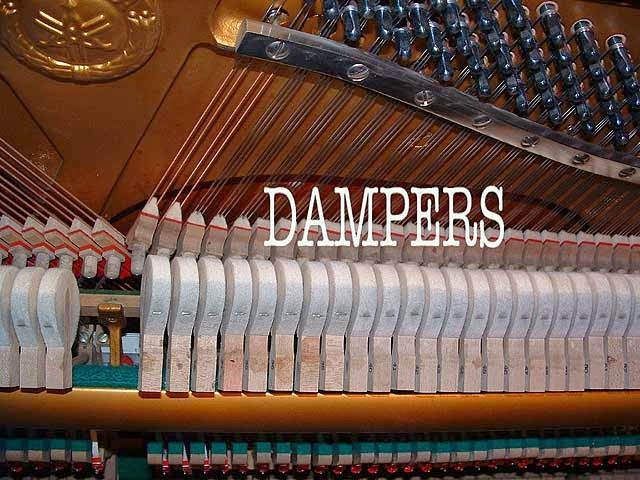 Whether or not a person can actually hear all of these naturally occurring organic elements that occur when using the damper pedal is directly related to their piano playing experience and their piano skill level, and even the type and age of the piano they are playing. OK...so how does all this impact a digital piano? In a digital piano, with very few exceptions, there are no actual dampers with felt on them, no strings, no actual hammers with felt on them, and no full length organic pedal mechanisms that attach to dampers. The physical pedal feel is important just like it is on an acoustic piano including the pressure it takes to push down the pedals with your foot, the pedal resistance coming up, the pedal height off the ground, and even the spacing and color of the pedals. All of these things make a difference in the piano pedaling experience for beginners or professionals. The pedaling sustain sound itself is simulated electronically in digital pianos including the damper pedal resonance, the half-pedaling with everything being digitally reproduced, and what comes out of the speakers in these digital pianos when pressing the pedals. All digital pianos have speakers built in (left pic), and with only a few exceptions, most have no wood soundboards like acoustic pianos do. So the piano sound you are hearing in almost all Yamaha, Roland, Kawai, Casio, Kurzweil, and other brands of digital pianos is digitally reproduced, as I mentioned before. The digital piano pedaling systems are not created equal when it comes to the piano sound you hear through those sepakers. In fact, many of them are cheaply made either in the actual pedal construction, materials, or the way they work in reproducing a natural damper pedal experience. I want to say right now "if you don't pay attention to the way the piano pedals work on a digital piano before you buy it, including the movement of the pedals and the piano sound they help produce, you may be very sorry." In digital pianos, some or all of the proper acoustic piano pedal traits may be missing from the playing experience in different new brands and models including having a good, longer damper pedal sustain time (decay time) coming from all strings when the keys are being played, the half-pedal effect, damper pedal resonance echo/reverb, sympathetic vibrations of the strings when the dampers come of the strings, damper noise (the movement of the dampers and damper rail makes a bit of noise in a real piano), proper pedal weight, proper pedal height, durable pedals, etc. The question is, does the digital piano(s) you are shopping for have these pedal functions and effects, along with having quality pedal construction? There are some piano brands, especially the off-brands from China selling at Costco like Suzuki & Artesia, which in my opinion have very low quality pedal functions and effects as well as low quality materials and construction. Other more well known brands may also have relatively short sustain/decay time, no half-pedaling, no damper resonance, or hard to press pedals that are at the wrong pedal height. 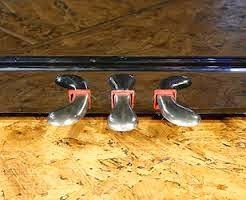 It is important to note that I did not discuss the middle and left pedal in this blog post because they are seldom used as compared with the damper sustain pedal, but do have there place in music and piano playing and should not be overlooked, especially the left (soft/una corda) pedal. However, for the vast majority of piano students and recreational piano players, it's the damper pedal which is most important and a part of the piano buying decision that needs to be considered when doing your research and trying out pianos. There are a few other aspects and details of piano damper pedaling in acoustic & digital pianos that I did not talk about here such as the speed at which the dampers come back down on the strings in an acoustic piano when the damper pedal is released, called Key-Off effect. This effect is reproduced in certain digital pianos increasing the authenticity of the true piano sound and pedaling experience. However, I wanted to keep this content as simple as I could and not get too caught up in minute details which most people shopping for digital pianos may likely not recognize when they hear them. At the end of the day, especially if you are a beginner, learning to play the piano damper pedal correctly and to know when to press the pedal while playing your music does take time to learn and it's not usually something you start using until you've been taking lessons for at least 1 year. For some people using the pedal to enhance the your playing experience comes more naturally and for other people they need to really work at getting the technique down and to understand how the damper pedal fits in to their overall piano playing & musical enjoyment. When shopping for a new digital piano, the pedals are important, especially the sustain damper pedal, and those pedals need to work well. 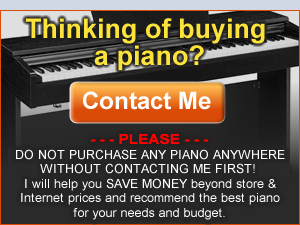 So before you make a piano purchase, definitely do your research and homework and contact me if you have questions as I will be happy to help. I really like the sound of an upright piano with the soft pedal engaged. I have come across some virtual instruments (e.g. Felt Piano) and even an iPad instrument (Soft Piano in iGrand), but haven't yet found a digital piano with a good soft pedal sound. Are you able to make a recommendation? Ideally I'm looking for a furniture model in the 1000 - 2000 USD range. I have played many digital pianos that have had an acceptable soft pedal including Roland, Kawai, etc in different price ranges. On some of those pianos you can also change the piano voicing to a mellow and softer tone to emulate a soft pedal. So there are different ways on different models to get what you want. Curious as to what pianos you played that did not have a soft pedal that was acceptable to you?